We always talk about Bug Out Locations in the abstract: “I’ll grab my bag and go” Go where? “The wilderness” is not an answer. If you don’t have a specific location you are unprepared. Bug Out contains a detailed list of 275 prime wilderness Bug Out Locations. 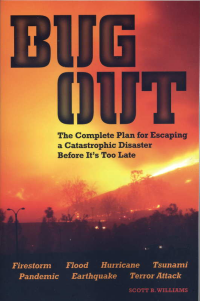 Bug Out: The Complete Plan for Escaping a Catastrophic Disaster Before It’s Too Late by Scott Williams is an excellent survival book dedicated completely to your Bug Out Plan. Full Disclosure: Scott was nice enough to send me a free copy of the book to review here, but I’m going to give you my honest opinion about it regardless. Bug Out was published in June 2010 and has 302 pages packed full of information, detailed maps, illustrations, and gear lists. 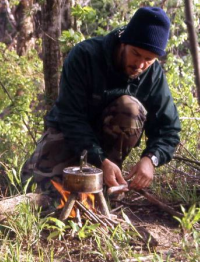 The Fantasy and Reality of Living Off the Land – Scott gives a very down to earth perspective and shares the stories of several famous survivalists, both good and bad. The Bug Out Bag – Covers everything from choosing your bag to important gear selection. He goes over essential survival gear and doesn’t recommend bunches of modern junk gear. Advance Planning and Location Selection – Gets into the meat of the book and encourages readers to carefully choose their Bug Out Location by region and important things to remember about climate, terrain, natural resource, and various types of public use land. Transportation – This chapters his almost all of the possible means of travel you could use in getting to your But Out Location and the pros and cons of each. The second half of the book is a gigantic and detailed list of Bug Out Locations made up mostly of public use lands like National Parks, Forest Service, Bureau of Land Management, Corps of Engineers, Wildlife Refuges, State Land, and some private land areas. The 275 possible Bug Out Locations are broken down into 8 regions of the country. 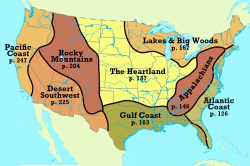 Each region is outlined with a detailed map and information on weather, climate, land, resources, hunting, fishing, wildlife hazards, and specific equipment needed. Many of the 275 Bug Out Locations in the book get their own section of several paragraphs detailing things like the exact location, size of the land area, means of access, resources in the region and main other useful tips. This section of the book is not something you would sit down and read cover to cover, but use as a resource for planning and scouting Bug Out Locations in your area. You really have to read it to understand the level of research and detail that went into this guide. Scott B. Williams has been exploring wild places perfecting his wilderness survival skills for most of his live, beginning with hunting and fishing while growing up in Mississippi. His adventures include thousands of miles of solo long-distance sea kayaking journeys in the U.S. and abroad, as well as extended wilderness canoeing and backpacking trips in every region of the U.S.
Scott has published four previous books including On Island Time: Exploring the Caribbean, Exploring Coastal Mississippi, and Paddling the Pascagoula. He also blogs about Boat Building and of course his dedicated site But Out Survival. The first half of the book on packing your bag and transportation might be somewhat basic for the more experienced prepper, but the incredible Bug Out Location encyclopedia in the second half makes picking up a copy more than worth it. Finding 3 public wilderness land areas within reach of my home for possible Bug Out Locations that I didn’t know about. Overall I would highly recommend this book for anyone who does not have a specific Bug Out Location already planned, or anyone who might want to find more possible locations in their area. The first half of the book makes a great introduction to building a Bug Out Bag for newer preppers. Bug Out: The Complete Plan for Escaping a Catastrophic Disaster Before It’s Too Late is available for about $5 below cover price on Amazon where it has quite a few 5 star reviews.